For your convenience, we accept cash, personal checks, money orders and most major credit cards. Payment is expected at the time services are performed. Feel free to contact our office if your treatment plan requires more comprehensive dental work and you want to discuss financial arrangements. We understand our economy has presented everyone of our patients with some financial challenges. That being said, at Juan R. Lopez, DDS, providing accessible dental care is a key element in the overall patient experience. Therefore, we try to find ways to help our patients without dental insurance. In an effort to do so, we are pleased to offer our Smiles R Us Savings Plan. This is a dental discount program. This plan allows our patients to receive optimal dental care while saving money. 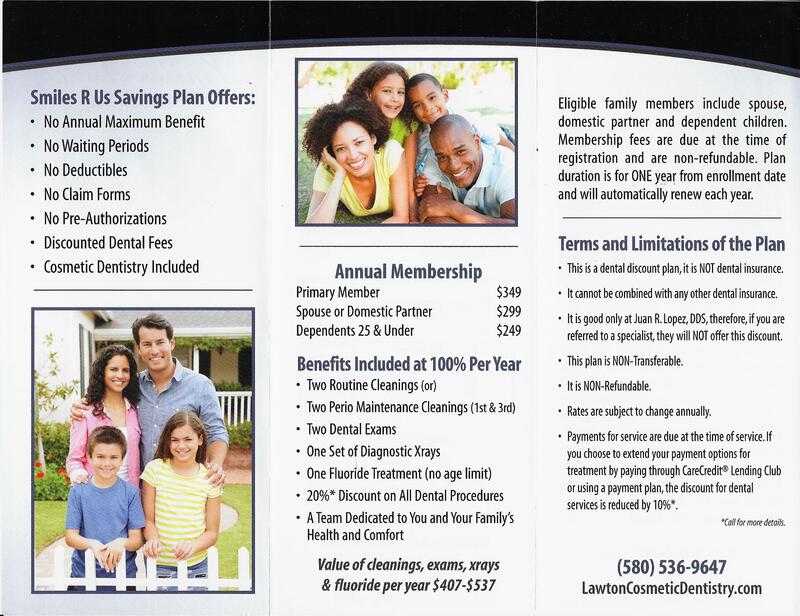 As a member of this Savings Plan, you save on everything from cleanings and x-rays to fillings and crowns. Look below to see our brochure and call our office (580) 536-9647 if you have any questions. We look forward to hearing from you and answering any questions you may have! As a service to our patients, our practice accepts most dental insurance programs, including non-managed care, indemnity (traditional) and PPO out-of-network. We are PPO providers for Delta Dental, Healthchoice and Cigna dental insurances. Our accounting staff will prepare all the necessary forms for your dental benefits. However, we remind you that your specific policy is an agreement between you and your insurance company. Please keep in mind that you are responsible for your total obligation should your insurance benefits result in less coverage than anticipated. Our staff will gladly submit a pre-treatment estimate to your insurance company so that you will know what your benefits will be. The fees charged for services rendered to those who are insured are the usual and customary fees charged to all our patients for similar services. Your policy may base its allowances on a fixed fee schedule, which may or may not coincide with our usual fees. You should be aware that different insurance companies vary greatly in the types of coverage available. Also, some companies take care of claims promptly while others delay payment for several months. If your insurance has not paid benefits to our office within 60 days-you are responsible for the balance on your account. With very simple steps, including an instant approval process, it's easy to apply for Care Credit and Lending Club. After you're approved, you're free to use CareCredit or Lending Club to finance our services. Now you don't have to worry about saving up for the procedures you want and need. With CareCredit and/or Lending Club, the decision's in your hands to get what you want, when you want it. For more information or to apply online, visit carecredit.com, lendingclub.com or simply click on the above links for instant access to applications. Any questions-Please call us at (580) 536-9647. We'll be glad to help!